As part of our 2017-2018 season we’re continuing to give each of our core singers a turn at the helm of the blog. The below post below comes from our bass, Steven Hrycelak. So much of the history of Western music centers around tonic and dominant harmonies, as well the dominant’s functional cousin, the subdominant. For those of us obsessed with symmetry, however, it is worth noting that the thing that divides the octave in half is the tritone — which is exactly in between the fourth and fifth scale degrees, upon which the subdominant and dominant chords are built. To achieve a scale that contains these fourth and fifth scale degrees, major and minor scales are made of various combinations of whole and half steps. Scale degree four and five are a whole step apart, but a scale of only whole steps would contain neither of these pitches; that is, neither a perfect fourth nor a perfect fifth above the root would be in this scale. How, then, to achieve something more symmetrical? More contemporary composers have explored two options. First, the whole tone scale, which divides the octave into six equal whole steps, and the tritone into three equal whole steps. Dominant and subdominant harmonies are not a part of compositions employing this scale, and any given scale degree has less prominence, but a feeling of completion or circularity may still be felt as the octave is achieved, depending on how the composer uses this scale. The other frequently employed option — more of a technique than a scale, per se — is based on minor thirds, which can stack indefinitely to create diminished triads. This divides the octave into four equal parts, or the tritone into two equal parts. I find that this configuration further downplays the prominence of scale degrees, meaning that nothing feels like a root as diminished triads endlessly invert. Chris Trapani, in his piece End Words, explores a further division of this symmetry — and one that we are not used to either performing or hearing. In the second movement this piece, the building block is a scale in which the minor third is cut in half; in other words, each scale degree is equal to 1.5 semitones. In this way, the octave is divided into eight equal parts; the tritone, into four. In my experience in working on this piece, this adds to a further lack of grounding, or a feeling of weightlessness, as the size of the interval is not one that we encounter regularly. But, since each interval is the same size, perhaps there is also something grounding in that? Maybe you have another reaction altogether? I’d love to know what you think, when you come to hear us on Friday night! As part of our 2017-2018 season we’re continuing to give each of our core singers a turn at the helm of the blog. The below post below comes from our soprano, Charlotte Mundy. What would it mean for classical music if the score wasn’t the definitive version of the piece, but just a guide – a starting point? I find it exciting, then, that three of the pieces on our program on October 7 require the study of non-visual material apart from the score, i.e. recordings, as part of the rehearsal process. Primo Libro by James Weeks uses a tuning system that divides the octave into 31 notes (as opposed to the usual 12). The intervals are audible but so tiny that they’re hard to comprehend unless you’ve already heard them, preferably multiple times. They’re virtually impossible to read off the page. The only way to come close to learning this piece properly is to use a synthesizer to render Weeks’ insanely precise (and also incredibly expressive and dramatic!) melodies and vertical harmonies. Her Disappearance is graphically notated, and intended to be a relatively ‘open’ piece. It should, in theory, be possible without hearing the recording of the composers’, Bethany Younge and Kayleigh Butcher’s, performance. But the recording has been indispensable in helping Elisa (Ekmeles mezzo) and I understand how to approach the piece. I think our concert on October 7th proves that re-thinking how music is written, disseminated and learned opens up space for more flexible, exciting, new sounds. It will also ultimately open up the role of ‘composer’ to people who have brilliant musical ideas but don’t feel at home between the five lines of the musical staff. I’m looking forward to seeing what comes next. As part of our 2016-2017 season we’re giving each of our core singers a turn at the helm of the blog. The below post below comes from our tenor, Steven Bradshaw. I begin my tenure with Ekmeles on December 1st, diving into Zosha Di Castri’s bold work The Animal After Whom Other Animals are Named for 6 voices and electronics. The first thing that struck me about the score was the space it left for each musician to make decisions. It’s a certain type of composer that writes this way and her technique is conducive to the kind of music-making I’m interested in. The piece jumps back and forth quite sporadically between rhythmic speech and complex harmonies, interspersed with vocal figures of a more approximate nature. Studying the piece and shaping the performance of my part has been an unusual process. While the artistic choices available to us in the harmonic sections are more-or-less familiar, the sections of speech and approximate vocal phrasings — wailing, screeching, growling, glissandos, whistling, and white noise — are very enveloping. It’s an expansive sound world beyond traditional vocal repertoire, made even more-so by the amplification which unlocks another layer of possibility. No longer bound by the acoustics of Miller Theatre, the sounds of a mysterious forest teeming with life emerge from a landscape of electronic drones and glitches. Blood-curdling howls and whispered hissing can be heard equally in this thick atmosphere. My part alone calls for shrieking high Es followed shortly by a long drone waving microtonally and drifting into white noise before eventually choking out and gasping desperately for air in the span of less than a minute. The text, it seems to me, gives voice to a consciousness that cannot express itself in this way. It reminds me of Arthur C. Clarke’s wonderful writing in the beginning of 2001: A Space Odyssey, in which the author tells the story through MoonWatcher: the hominid. Healey’s poem reflected through the prism of Zosha’s menacing score seems to speak to the chaos and insanity of nature. Music and the written word have a unique ability to unlock a point-of-view that is truly… other. As part of our 2016-2017 season we’re giving each of our core singers a turn at the helm of the blog. The below post below comes from our bass, Steven Hrycelak. Ekmeles first had the opportunity to perform Zosha Di Castri’s The Animal after Whom Other Animals are Named three years ago. We loved it then, and performed it again soon after. What a rare treat to revisit a piece for a third time in as many years, and for such an exciting series as Miller Theatre’s Composer Portraits on December 1st. The work utilizes electronics, which create a widely varied aural backdrop for the six vocalists. And Di Castri asks the singers to use an enormous array of techniques, from booming oration and the use of a megaphone in the bass part, to whispering, muttering, gasping, sobbing, shuddering, humming, growling, whispering, gulping, and the use of vocal fry in all the voice parts. Extremes of range and dynamics, microtonal tuning, and vibrato usage also create a really dramatic, constantly evolving palette of colors. What I love about both the challenge and extreme variety of this, however, is that it all feels purposeful and so well suited to Nicole Sealey’s text. There are moments of fairly traditional singing in the score, but they are always amped up by Di Castri’s layering of other vocal techniques. Moments of homophonic writing are very rare, and are usually reserved for moments of dramatic outburst, when it is clear that the composer wanted the text to be boldly stated by the voices together. There is one notable exception, and it is one of my favorite moments in the score. 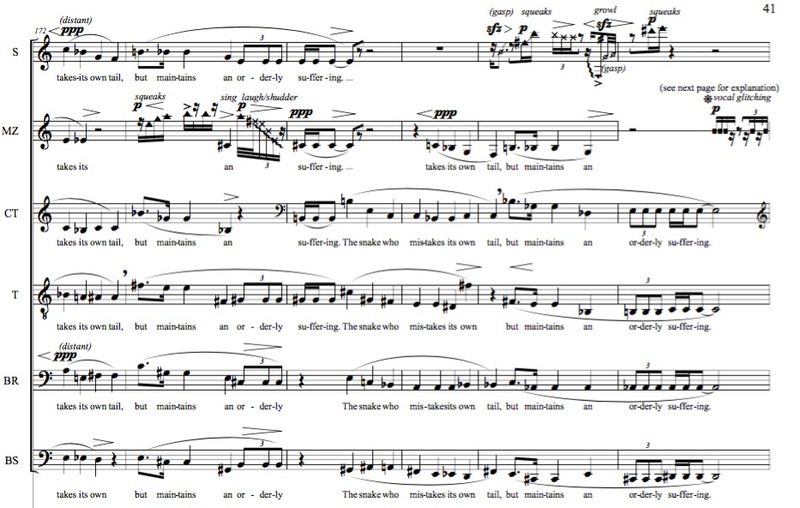 Here, at letter I, 4-6 of the voices at any moment (though the personnel are constantly shifting), are homophonically singing the text “the snake who mistakes its own tail, but maintains an orderly suffering.” And the text setting is truly remarkable! Even visually, and certainly through the chromaticism, the slithering of the snake is apparent. The highest sung pitch ascends by half step over the first three measures, from C# to C to B and passing from mezzo soprano to soprano, as the snake slithers. This pattern repeats starting on beat 2 of the fourth measure, but down an octave, and is passed from tenor to mezzo soprano. The countertenor has quite literally dropped an octave on this second iteration, moving fully into baritone range, and changing the color of the sound entirely. The vertical sonorities are quite dissonant throughout, but are most consonant in each phrase on the word “orderly,” employing a straightforward minor seventh chord, the first time in third inversion, the second time in an incredibly low root position. The first setting of the word “suffering” maintains the same chord as was heard on “orderly,” though with the voicing all shifted around. When “suffering” appears a second time, however, the chord is very low, dark, and dissonant. Di Castri continues to employ some other vocal sounds in this section – most notably, the laugh/shudder of the mezzo soprano, disrupting the orderliness of the first iteration of “orderly” – and these effects do enhance and comment on the more “traditional” homophonic vocal writing, as they do throughout the piece. But for me, the harmonies and the movement between them, in addition to the plummeting register of the section over all, create masterful text setting and a truly special musical moment. Universal Edition has put online the scores to each of Wolfgang Rihm’s string quartets, celebrating their performance at the 5e Biennale de quatuor à cordes. It’s a wonderful opportunity to peruse these scores at your leisure, without leaving the comfort of your desk!